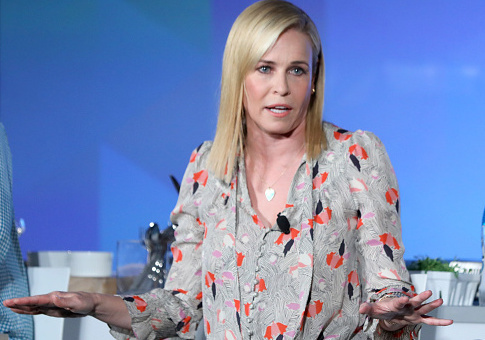 Liberal comedian Chelsea Handler attacked Sarah Huckabee Sanders' appearance on her weekly Netflix show, calling the White House press secretary a "harlot" who wears "summer whore lipstick." The clip, flagged by the conservative Media Research Center, is from the Dec. 1 episode of "Chelsea," titled "Dinner Party: Scandalous," and shows Handler interviewing Lanny Davis, a lawyer and former special counsel to President Bill Clinton. "When somebody from the Trump White House stands at the lectern and tells us that black is white—" Davis said before Handler cut him off. "That harlot that they are dressing up and trolloping out every day?" Handler said, referring to Sanders. "I mean, one day she has no makeup on at all, the next she's got like 6′ long eyelashes, cleavage, and summer whore lipstick all over her face." "Can you believe what they've turned her into?" Handler asked. "A proper trollop." Davis chuckled before continuing his point. "I'm referring to the fact that she tells me that something that I see is dark blue is actually white," he said. Handler announced in October that she is ending her Netflix show after its second season concludes to devote time to becoming a "more knowledgeable and engaged citizen." This entry was posted in Culture and tagged Chelsea Handler, Sarah Sanders. Bookmark the permalink.